In InStream you can gather all information you need. To do that you can create custom fields on the contact detailed view and on relation lists in the grid view. In order to gather all specific information about your relations create custom fields on the grid view. Notice: only an admin of the list can create new custom fields. Open a personal or companies relations list and click on the “add” button” on a heading of a column. In order to add a new field, you need to first choose the right category, find it on the list and click on the blue “plus” icon. Then, choose the field from selected category. Once you add a new field, it will appear in the left menu bar of the editing window. Additionally, you can edit standard fields like Text, Number or File so that each field can have a different name or contain different type of data. 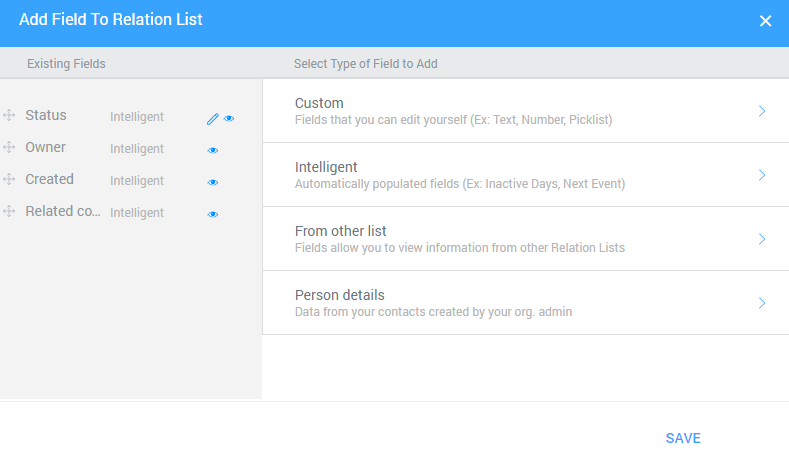 Notice: You can choose from more than 30 different types of custom fields, which you can adjust and add to your list. The most common fields are standard, intelligence, other lists and Contact/Company. You can collect data about last communication date, type of the last contact, income from transaction etc. You can keep adding new customized fields or click on the “save” button. New fields will automatically appear on your list, at the end of the first row.